Diagnostic Laboratories play an important role in the diagnosis of disease before the start of treatment and also monitoring of patient once the treatment has been initiated. All the Diagnostic Laboratories of this Hospital are equipped with high end equipments. 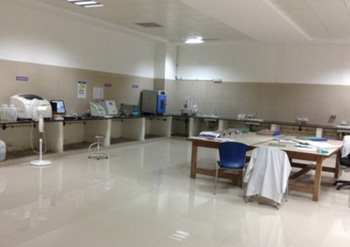 Pathology Laboratory: Performs Biopsy Testing, Cytopathology studies like Fine Needle Aspiration Cytology, Pap Smear Study ,Body Fluid Cytology for Malignant Cells, Imprint Cytology and Haematology Investigations for detection of Anaemias and Coagulopathies using the latest fully automated analysers. Even the urine analyses and Microscopy is done by the Automated Analysers. Biochemistry Laboratory: Modern equipments for measuring levels of various substances in blood like Glucose, Urea, Creatinine, Total Cholesterol, Lipid Profile, Sodium, Potassium and Chloride Levels, Total Bilirubin including both direct and indirect levels, total proteins with separate Albumin, Globulin and A/G Ratio, SGOT and SGPT levels, Alkaline Phosphatase, Serum Calcium, Serum Uric Acid,Serum Lipase and Serum Amylase levels is performed. Regular quality control checks are performed on these equipments; hence the test result is very reliable. MICROBIOLOGY LABORATORY: Tests for identifying various infections like HIV, HBsAg, HCV, RPR/TPHA, ASLO, CRP, RA, Pregnancy tests, WIDAL test, Malaria, Dengue, WEIL FELIX test, Leptospira, KOH mount, INDIA INK, Stool Analysis, Modified ZN stain, Gram’s stain are performed. Apart from this culture and sensitivity tests of Blood, Urine, Sputum, Body Fluids, Pus, Swabs, Stool, Surveillance Cultures of wards/OTs and fungal cultures are all done on a routine basis. 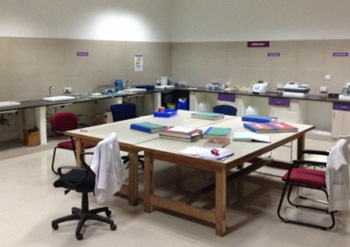 Equipped with modern equipment and well experienced manpower the laboratory provides round the clock services. We also have separate Sample collection unit and Testing Conducting units.